The Power of Art And Music For Addiction Recovery - Full Potential, Now! One aspect of recovery that often gets overlooked is leisure. When you stop drinking or using, you create a void in your life, both emotionally and in terms of your daily schedule. Productive, creative hobbies are the best way to fill this void. They minimize stress while maximizing confidence, happiness and social fulfillment. This positive influence is why art and music therapy have both become so popular, but how exactly does this work? According to the National Institute on Drug Abuse, about half of people who suffer from a mental health disorder will also develop a substance abuse problem and vice-versa. Addiction is incredibly closely linked with mental health as a whole, which means that any effective recovery program should also be tackling these adjacent problems. Perhaps the main reason art and music are effective therapies for addiction is that they are effective therapies for mental health problems as a whole. 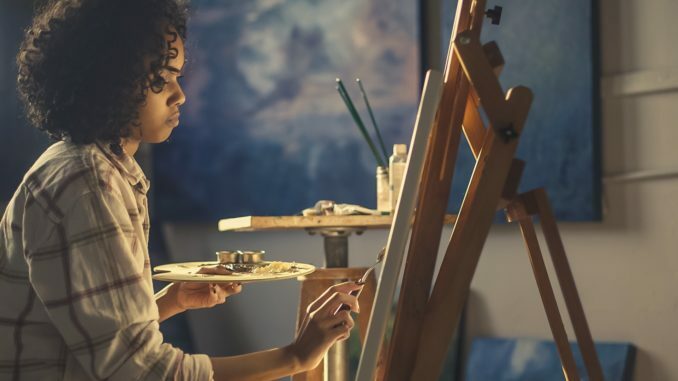 There is extensive research that both music therapy and art therapy can be an effective tool to combat depression, anxiety and PTSD, all of which are common underlying factors in addiction. There is an established connection between addiction and low self-esteem. People who lack confidence often turn to drugs, alcohol or dangerous behaviors as a way to cope, while addiction itself can make someone feel like they are worthless because they can’t escape. Creative hobbies including art and playing music are wonderful ways for someone to build confidence. This is because there is a sense of progression inherent in them. You practice, you create things you are proud of, and you continuously improve to make even better things. You start seeing yourself in a more positive light, and this can help you stay strong in a moment of temptation. Closely linked to this sense of confidence is the idea of control. Addiction can make someone feel utterly powerless, like they have no control over their life, their decisions and even their emotions. Active and creative activities such as painting, sculpting or playing music all place you in control of the situation and its outcomes. You make all the decisions and you can choose how to express yourself, giving you control over your emotions and how you process them. This sense of control and autonomy can be invaluable for someone who is trying to get a handle on their lives. There are many ways you can get the benefits of art and music therapy during your recovery. One option is to look for rehab centers that offer these therapies as part of their programs – these are becoming increasingly common and easy to find. You can also build these hobbies into your life by yourself. Set up a studio space in your home, dedicated entirely to your chosen creative hobby. This will help you focus and make the most of your art and is possible even if you have a small home. Alternatively, you could join a class in your area. This has the added benefit of helping you meet new people, which could become new friends: Hip Sobriety has some great advice on how to make new friends in recovery. As with most tools for recovery, art and music therapy function best when blended with other forms of support such as regular group meetings, one-on-one counseling or a regular fitness regime. Each of these tools has a specific purpose that is enhanced by the others, creating a solid routine that aids recovery and prevents relapse. In the case of creative hobbies, their role is to improve the recovering addict’s relationship with themselves and to place them in a positive frame of mind that allows for growth and positive change. This blog was guest-written by Michelle Peterson, founder of RecoveryPride.org. My friend did this and it’s really amazing. He was previously an addict when he became an artist.